Meet The U.K.'s Cutting-Edge Research Vessel ... Boaty McBoatface? 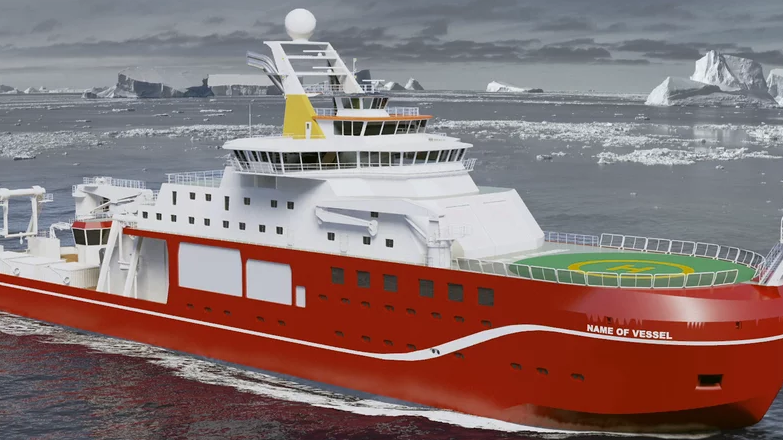 : The Two-Way In an online poll created to help Britain's Natural Environment Research Council name its new research ship, one entrant has racked up the most votes. The final decision, however, rests with the NERC. Imagine "Boaty McBoatface" emblazoned on the side of this ship. Shackleton, Endeavour, Falcon and ... Boaty McBoatface? These are some of the names that have been suggested for the United Kingdom's new state-of-the-art polar research vessel that's slated to take to the seas in 2019. Can you guess which one is leading the vote? Britain's Natural Environment Research Council asked the public to help think of possible monikers for the new world-class ship, urging them to look for "an inspirational name" that exemplifies the vessel's mission, a historical figure, movement, landmark or a famous polar explorer or scientist. "The polar research ship represents a leap forward in securing Britain's place as a world leader in marine and climate change science — and illustrates this government's commitment to invest in research facilities on a record scale," Jo Johnson, minister of universities and science, said in the initial press release. "Can you imagine one of the world's biggest research labs travelling to the Antarctic with your suggested name proudly emblazoned on the side?" A name like, you know, Boaty McBoatface. Since the NERC announced the poll, the Internet (as it is wont to do) hijacked it and went full-steam ahead with Boaty McBoatface. While the poll's Web page is experiencing "technical issues" due to what the NERC said was "overwhelming interest," Boaty McBoatface had amassed 27,000 votes as of Monday morning, while the second place pick had racked up around 3,000, according to the BBC. Other perhaps less-than-inspirational names suggested include Ice Ice Baby, Usain Boat and It's Bloody Cold Here. Alison Robinson, NERC's director of corporate affairs, said in a statement that the council is "pleased that people are embracing the [naming] idea in a spirit of fun," but noted that the NERC will have the final say over the boat's name. "We've had thousands of suggestions made on the website since we officially launched; many of them reflect the importance of the ship's scientific role by celebrating great British explorers and scientists," she said, adding, "We are very much enjoying hearing everyone's ideas." Meanwhile, the man who proposed the name Boaty McBoatface, former BBC radio host James Hand, has "apologized profusely" for his joke run amok. "I've actually been speaking to the people behind the website," he told BBC Radio. "It's actually nothing to do with me. It was my suggestion but the storm that has been created, it's got legs of its own." Hand says the response to his suggestion has been "utterly bizarre." "I read the list of entries and there were about 3,000 at the time. Some of them were really, really funny. Clifford the Big Red Boat was my favourite. So I thought I'd throw one into the ring to see what happens. It got a few likes and I thought nothing of it," he said, according to The Independent. "It's only when I got home and someone tweeted me and said Boaty McBoatface is leading by 500, and then by Friday night it was leading by a couple of thousand. Then, by the time the site eventually crashed yesterday, it was leading by about eight thousand," Hand said. "It's been quite a strange weekend." I'm terribly sorry about all of this, @NERCscience. Also sorry to journalists who've messaged me: I'm not ignoring you, I just don't have anything to add right now! Thanks for your interest. Hand says he actually voted to name the ship after naturalist David Attenborough, The Associated Press reports. Robinson says the poll closes April 16 and that the name will be announced in "due course."